Top Team Comps #93: Tanks for the Win! Here's a relatively balanced team that's not particularly strong in a single strategy except the one that matters most...not dying. This team can either snowball hard off early game Nunu/Urgot dominance or failing that, rely on a late game Vladimir + Vayne combination. Alistar is simply an excellent pick throughout the game, and allows this team to make big plays from any position. Vayne [Marksman] - On a team full of bruisers, Vayne excels as she weaves and dodges through the meat shields. This team also doesn't rely on her as their sole source of damage. This allows your team to pick up a more aggressive support for full on tank goodness. Even if the enemy team brings their own tanks into the mix, Vayne is here to chop them down to size. If absolutely necessary for the theme, she can even go Frozen Mallet to some a good effect. Vladimir [Mid] - Vladimir's mid to late game allows your team to focus more on offensive and less on peeling for Vayne. His AOE combos allow him to turn the tide of any battle, and he's incredibly tanky for a mid-laner. Sustained damage is the name of this team, and Vladimir fits the bill perfectly. Alistar [Support] - While it's difficult to roam when your marksman is Vayne, Alistar's a great hybrid of sustain and all-in capabilities. As a result, he can quickly adapt to any situation in the game to either roam, assist his jungler in invades, or simply play the normal support role. Nunu [Jungler] - Nunu in this team composition allows his team to secure scaling buffs for the late game and to also be a general nuisance to the enemy jungler early on. He works amazingly well with both Vayne and Vladimir thanks to the change in his AP ratio scalings on Bloodboil. Urgot [Top Laner] - In a team composition with two late-game lanes, Urgot pulls the team together by providing early game dominance. With an Urgot in the game, Nunu can focus on top lane and then shift to bot mid-game for Alistar assisted ganks. Stay top early game until Alistar and Vayne go back for their first shop, then focus bot lane for first tower and dragon control. Vladimir will likely need to just farm until level 6 and Protobelt, but if you see an opportunity feel free to gank. Grouping isn't particularly necessary for this team, so feel free to extend laning phase if Urgot is dominating particularly hard. 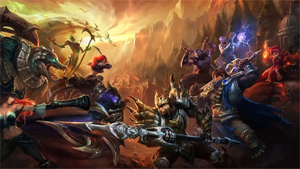 Countering this team involves either powerful team fights or pressing lane dominance and map priority to prevent Nunu from successfully ganking or counter-jungling. Morgana [Mid] - Abuse your waveclear and roam for ganks. Trundle [Jungle] - Fighting against tanks without a Trundle is giving away a free advantage. Make sure to pick the biggest, baddest enemy and target him with your ultimate. Janna[Support] - Against this kind of team composition, picking up a peel support is a good idea, and there are few that peel better than Janna. Xayah [Marksman] - As a strong counter to Vayne, Xayah also works very well against an Alistar team. Overall, this team also works very well, but is much more of a solo queue composition and doesn't have a main strategy for team fights.